Veeam software just released Veeam Backup and Replication 9.5 Update 4a. This is a very long-awaited major update to their flagship product. We have reported in details about the release here and here. And there are some good news today users who wish to back up their virtual infrastructure for a no cost. The U4 brings a completely Free Veeam Backup Community Edition. What is it? It is a free version allowing backing up to 10 VMs for free. 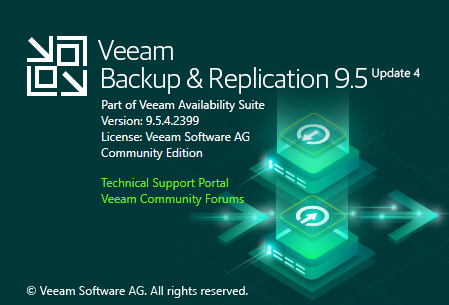 Veeam Backup Community Edition 9.5u4a ISO – Download Now. Users can start using Veeam without having to purchase any license. Wow. Isn’t it great news? Before we go into the details, let me say something. It’s been almost a decade since I follow Veeam as a company and blog about their products. It’s always a pleasure to do so and it’s very grateful to blog about something you like to use during the everyday’s operations and everyday life. Their approach to customers was always exemplary in order to know what’s the next feature they should integrate into their product. This is no different now and I have an enormous pleasure to announce this Veeam Backup Community Edition which will benefit small customers with small or no budget. You don’t need a license for community edition. Note: No longer than a few months back Veeam has released Veeam Backup for O365 Community Edition which allowing to backup 10 users for Free. But now, let’s focus on Veeam Backup 9.5 Update 4 and Community edition. It’s a “Standard” edition limited to protect 10 Virtual Machines (VMs). 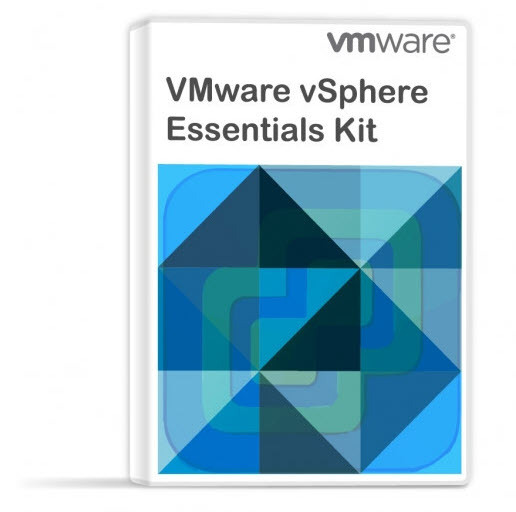 It means you can backup (including incremental or differential) your VMs as you would normally do with a Standard edition. This edition has incremental backups and scheduler which are a standard in virtualization backup and without which you can’t really think of backing up production VMs. By having this, it’s like having a full product with the limitation for 10 VMs. Item Level Recovery– with “Explorer” type free add-ons, as they were in the Free Edition of Veeam. For Microsoft Exchange – mailbox item restore via save, send and PST export. Enterprise Plus allows restoring back to original mailbox. For SQL Server – point in time export of SQL DB files locally. Enterprise and Ent. Plus include agentless transaction log backup and replay, transaction-level recovery of DB and SQL objects (tables, stored procedures, views etc) back to the original or new SQL server. For SharePoint – item restore via save, send and export. Enterprise and Enterprise plus have Entire site and site collection restore, and also, restore to the original location. Yes, there is also a replication feature included, which means that you can set up a second location with a remote office where you’ll be sending those replicas and which, in case of failure of primary datacenter can be powered On. As you can see, this is pretty much awesome all you can do with this Community Edition. 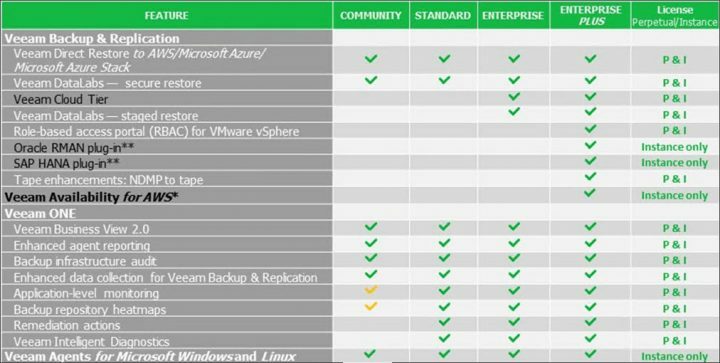 The Community Edition starts with Veeam Backup and Replication 9.5 Update 4a which brought many new features and functions to the product. Let’s recap those as well. Below you will find a write up on some features present in the U4 but which are not part of the community edition. The community edition is de facto the “standard” limited to 10 VMs. So there is not cloud tier, scale-out backup repository or Veeam Staged restore. The capacity tier has been redefined a little bit, from last year. Moving backup files – will now have this option for data that ages out of the operation restore window, to a cheaper storage – public cloud, or on-prem object storage solution. Immediate copy – this option which is also a valid data management use case (creation of backup copies) – will follow up later. It will be able to move files to Amazon S3 and S3-compatible object storage. Microsoft Azure will like come in the later update, then other as requested. SOBR will become effectively unlimited in regard to capacity and scale. Archived backup files remain on the SOBR extent on disk, in a different way. The archived backup file is a shell of their previous contents; metadata and pointers to their archived blocks are retained on the SOBR extent. Veeam data movers can read these file transparently, so all functionality is maintained. The backup file dehydration into the archive tier is forever-incremental and there is source -side deduplication between multiple GFS full backups. Veeam staged restore allows the admin to restore to an isolated environment (to an isolated environment), then inject and run a script allowing to remove some data which the admin does not want to restore to the production environment. This is pretty huge as it will allow isolating some stuff which has been “captured” when you backed up your VM. As an example, we can talk about the regulation of personal information storage. If you have some customer data which should not be restored to the production environment, this is the way of doing it. With Veeam Staged restore which allows you to remove those data before hitting the production. When you look at ransomware scenarios. Someone downloads an infected file and it’s a day zero, so your antivirus doesn’t know that the file has been infected. Then, a few days later, after the antivirus definitions get an update, the file will be signaled by your antivirus software. But how about your backups? Well, your backup files will be obviously infected. With this you’ll get the option to restore to an isolated environment > clean the system > then restore to production. Without this, you would restore including the infected file (which might have possibly acted like a “time bomb”). So obviously risky. Ransomware is a pain. I tell you. When you’re hit, it’s a lot of time you’ll have to spent do figure out things. And if your backups are infected with ransomware or a virus because of zero-day vulnerability, you’ll end up with some of your backups not usable at all. And that’s where the antivirus scan of your backup files makes real sense. 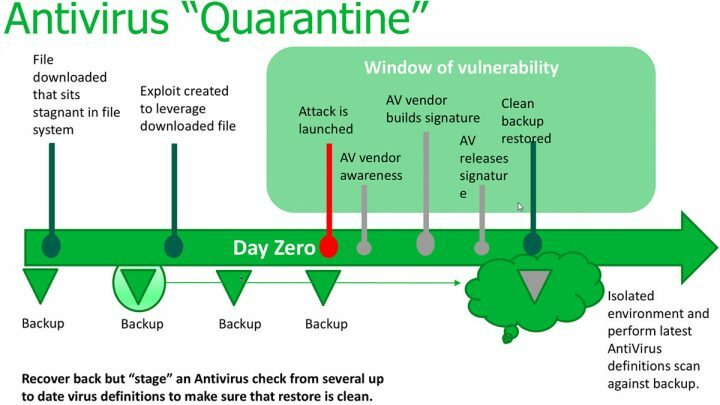 The antivirus vendor learns new virus and malware signatures every day, so previous backups scanned in the future might reveal some surprises. Veeam continues to be N°1 in the data protection market. It’s the best and most reliable product whether you’re a very tiny shop or large enterprise corporation with many satellite offices. Veeam? It just works. And it is still the valid sentence and valid statement. I remember, and it seems that it’s been just a few years back, that the reliability of backup software products (they were exceptions) were kind of discutable. And it’s been Veeam who brought the expected reliability. It was a Veeam Sure Backup first to do a real-life recovery verification of your backups. ESXi Free vs Paid – What are the differences? Can send copies to service providers?